Reading and share top 24 famous quotes and sayings about Human Divinity by famous authors and people. 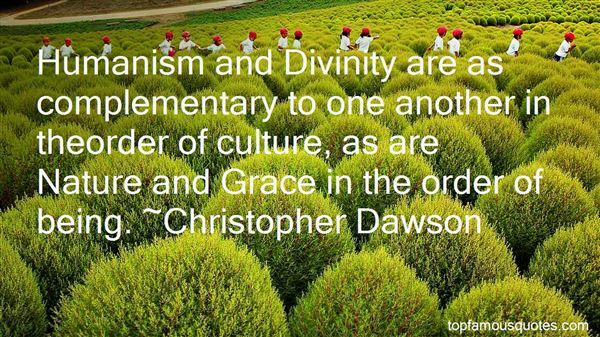 Browse top 24 famous quotes and sayings about Human Divinity by most favorite authors. 1. "The body, whether it be human, mammal or insect, is nothing more than a machine designed as a vehicle intended to be used by the "soul." The brain, is perfected engineering inspired by divinity. Therefore, the world we see and touch is just an illusion because life and death are one in the same; essentially, we are heaven, eternal and ever lasting." 2. "The sacred rights of mankind are not to be rummaged for among old parchments or musty records. They are written, as with a sunbeam, in the whole volume of human nature, by the hand of the divinity itself; and can never be erased." 3. "This day have I begotten thee." If this refers to the Godhead of our Lord, let us not attempt to fathom it, for it is a great truth, a truth reverently to be received, but not irreverently to be scanned. It may be added, that if this relates to the Begotten One in his human nature, we must here also rejoice in the mystery, but not attempt to violate its sanctity by intrusive prying into the secrets of the Eternal God. The things which are revealed are enough, without venturing into vain speculations. In attempting to define the Trinity, or unveil the essence of Divinity, many men have lost themselves: here great ships have foundered. What have we to do in such a sea with our frail skiffs?" 4. "To survive as a human being is possible only through love. And, when Thanatos is ascendant, the instinct must be to reach out to those we love, to see in them all the divinity, pity, and pathos of the human. And to recognize love in the lives of others - even those with whom we are in conflict - love that is like our own. It does not mean we will avoid war or death. It does not mean that we as distinct individuals will survive. But love, in its mystery, has its own power. It alone gives us meaning that endures. I alone allows us to embrace and cherish life. Love as power both to resist in our nature what we know we we must resist, and to affirm what we know we must affirm. And love, as the poets remind us, is eternal." 6. "In mythos and fairy tales, deities and other great spirits test the hearts of humans by showing up in various forms that disguise their divinity. They show up in robes, rags, silver sashes, or with muddy feet. They show up with skin dark as old wood, or in scales made of rose petal, as a frail child, as a lime-yellow old woman, as a man who cannot speak, or as an animal who can. The great powers are testing to see if humans have yet learned to recognize the greatness of soul in all its varying forms." 7. "Dear Human:You've got it all wrong.You didn't come here to master unconditional love. This is where you came from and where you'll return.You came here to learn personal love.Universal love.Messy love.Sweaty Love.Crazy love.Broken love.Whole love.Infused with divinity.Lived through the grace of stumbling.Demonstrated through the beauty of... messing up.Often.You didn't come here to be perfect, you already are.You came here to be gorgeously human. Flawed and fabulous.And rising again into remembering.But unconditional love? Stop telling that story.Love in truth doesn't need any adjectives.It doesn't require modifiers.It doesn't require the condition of perfection.It only asks you to show up.And do your best.That you stay present and feel fully.That you shine and fly and laugh and cry and hurt and heal and fall and get back up and play and work and live and die as YOU.Its enough.It's Plenty." 8. "The human creature, humiliated and offended in ways that are inconceivable to the mind and heart, defies the blind and deaf divinity." 9. "The humble, simple souls, who are little enough to see the bigness of God in the littleness of a Babe, are therefore the only ones who will ever understand the reason of His visitation. He came to this poor earth of ours to carry on an exchange; to say to us, as only the Good God could say: ‘you give me your humanity, and I will give you my Divinity; you give me your time, and I will give you My eternity; you give me your broken heart, and I will give you Love; you give me your nothingness, and I will give you My all." 10. "The solution to the problem of the day is the awakening of the consciousness of humanity to the divinity within." 11. "Plato offers the amazing idea that contemplation of the way things really are is, in itself, a purifying process that can bring human beings into the only divinity there is." 12. 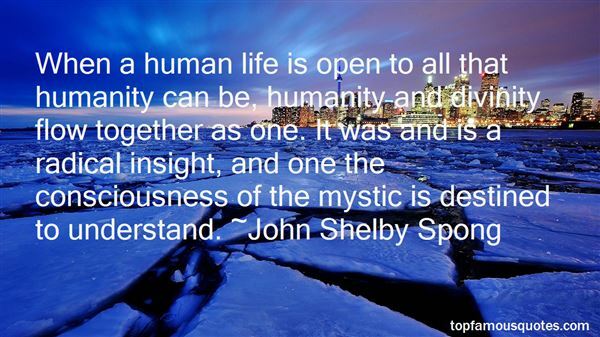 "When a human life is open to all that humanity can be, humanity and divinity flow together as one. It was and is a radical insight, and one the consciousness of the mystic is destined to understand." 13. "It's self-centered to think that human beings, as limited as we are, can describe divinity." 14. "Don't we all deserve forgiveness? I hope we do; I believe we do. Forgiveness says as much about the character of the person bestowing it as the person receiving it. Learning to forgive may be the most difficult of human acts,and the closest thing to divinity, whatever you decide that is." 15. "If you do the task before you always adhering to strict reason with zeal and energy and yet with humanity, disregarding all lesser ends and keeping the divinity within you pure and upright, as though you were even now faced with its recall - if you hold steadily to this, staying for nothing and shrinking from nothing, only seeking in each passing action a conformity with nature and in each word and utterance a fearless truthfulness, then the good life shall be yours. And from this course no man has the power to hold you back." 16. "When you lose reasoning you forget humanity,When you forget laughter you lose Divinity. Munindra Misra"
17. "Within biblical theology it remains the case that the one living God created a world that is other than himself, not contained within himself. Creation was from the beginning an act of love, of affirming goodness of the other. God saw all that he had made, and it was very good; but it was not itself divine. At its height, which according to Genesis 1 is the creation of humans, it was designed to REFLECT God, both to reflect God back to God in worship and to reflect God into the rest of creation in stewardship. But this image-bearing capacity of humankind is not in itself the same thing as divinity. Collapsing this distinction means taking a large step toward a pantheism within which there is no way of understanding, let alone addressing, the problem of evil." 18. "Living as human being and as a divinity.moving from tension into relaxation,from relaxation into trance,from trance into a more intense contact with other people.from that contact back into tension and so on,Like The Serpent swallowing its own tail." 19. "The path of compassion does not obligate you to love people regardless of how they act or who they are. It is a path of seeing the truth of who people are, acknowledging all their parts, their humanness as well as divinity. It is the path of looking at people and asking, "is there anything I can do to heal, assist, or bring them in touch with their higher vision?" If there is not, then you are pulling down your own energy by spending time with them"." 20. "A human who learns, and practices the art of love as does divinity, is no longer human." 21. "Heaven doesn't only teach humans about virtue and divinity.It also shows us about politics and corruption; and that's a fact." 22. "When the Bible is understood in its literary and historical context; errors, contradictions, and inconsistencies pose no threat to spirituality, whether that spirituality is theistic, non-theistic, or even explicitly Jesus-centered. The graver threat to what Christians call godliness may be fundamentalism - religion that flows from literalism and fear, religion based on anachronism and law. Fundamentalism teachers, in effect, that the tattered musings of our ancestors, those human words that so poorly represent the content of human thinking, somehow adequately describe God. Fundamentalism offers identity, security, and simplicity, but at a price: by binding believers to the moral imitations and cultural trappings of the Ancients, it precludes a deeper embrace of goodness, love, and truth - in other words, of Divinity." 23. "I finally knew... why Christ's prayer in the garden could not be granted. He had been seeded and birthed into human flesh. He was one of us. Once He had become mortal, He could not become immortal except by dying. That He prayed the prayer at all showed how human He was. That He knew it could not be granted showed his divinity; that He prayed it anyhow showed His mortality, His mortal love of life that His death made immortal." 24. 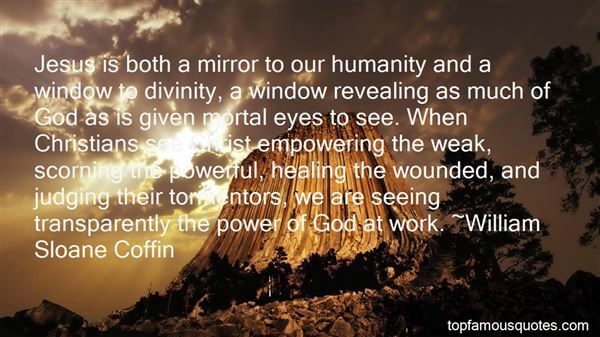 "Jesus is both a mirror to our humanity and a window to divinity, a window revealing as much of God as is given mortal eyes to see. When Christians see Christ empowering the weak, scorning the powerful, healing the wounded, and judging their tormentors, we are seeing transparently the power of God at work." What kind of a world do we live in that has room for dog yoga but not for Esperanto?"